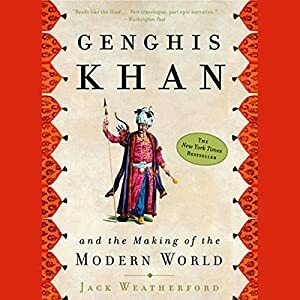 This book wasn't quite what I expected - I figured it would be about Genghis Khan's life, but it was actually just as much about how his legacy formed the modern world. Which, I must say, was a delightful surprise. The first half of the book chronicled Genghis Khan's life, starting with a very interesting childhood. I loved how much detail was included about Genghis Khan's strong-willed mother. She was kidnapped from her first husband soon after their marriage, and was awarded to her captor, Genghis Khan's father. But she didn't just submit. She helped her first husband escape by letting herself be captured. Then, when Genghis Kahn's father suddenly died, the whole family was left to die by the rest of their group. But Genghis Kahn's mother had different plans. She kept the family alive against all odds. She was even willing to marry her step-son (only one year older than her own son) to make the family cohesive. But this is when Genghis Kahn's conquering spirit fired up - he didn't want his mother marrying his brother, because then his brother's place as head-of-household would be solidified. Instead, he encouraged his younger brother to shoot the elder. Interestingly, when he formed universal laws for his empire later in his life, such intra-family killings were outlawed. After the incident with his brother, the narrative began to follow Genghis Khan rather than his parents. What I found interesting about this part of the book was that he was not portrayed as a conquering tyrant as he generally is in modern media. He was portrayed as cunning and wise. His laws were fair, reasonable, and well-thought-out. There was only very a little talk of battle strategy and history in this book. I had wished to have more of such information, but I can always read a different biography of Genghis Kahn. The purpose of Weatherford's book was not to chronicle a history of Genghis Khan's wars but to give a previously unseen glimpse into Genghis' private life, personality, and how his legacy changed the world. One thing that I found particularly wise about Genghis Kahn was his realization that nepotism does not necessarily lead to the most devoted followers. Promoting one's family first was common among his people, so Genghis Kahn was breaking cultural norms when he promoted by loyalty first. And it was amazing what kind of loyalty he inspired. He must have been a very charismatic man. The final part of the book was about Genghis Kahn's legacy. How his universal laws shaped the area even after they were neglected by his descendants. How his descendants spread around the world and made their own little kingdoms. How the trade routes he created became the major East-to-West connection for centuries - a connection that Columbus was trying to rebuild when he attempted to sail around the world to India. Great commentary on this Rachel. This sounds so good. I do not know much about Genghis Khan but I have heard that his rule was not all conquest and oppression. I should give this a read. Thanks Brian! He did a lot of really good research for this book. Yeah, I've heard the same thing about Genghis Khan's descendants. I wonder how true it is. I really enjoyed learning about his private life - this book is based on recently released documents about Genghis Khan, so this isn't something that has been covered in the past.